Los Angeles–Vaccine industrialist and media mogul, Mortimer Zuckerman, Editor-in-Chief of US News & World Report, has fraudulently promoted the benefits of vaccines that are killing children, according to a public health expert whose research has identified shocking conflicts of interest between Zuckerman and the makers of the HPV (Human Papilloma Virus) vaccine. Merck’s Gardasil and Glaxo-SmithKlein’s Cervarix are being touted by Zuckerman’s “yellow press” as beneficial, when growing evidence indicates the vaccines for HPV are neither safe or effective. Dr. Leonard Horowitz, a Harvard-trained authority in vaccinations and emerging diseases says it takes months and years beyond their trial periods for vaccine injuries and related deaths to occur. Most adverse events are, therefore, never counted or considered by federal authorities that certify vaccines’ safety. Nonetheless, news sources and health officials claim that vaccines receive adequate safety testing. According to drug company studies accepted by the FDA, 13% of teenage girls faint after getting HPV vaccinations linked to dozens of deaths from blood clots, seizures, heart attacks, appendicitis, anaphylaxis, and Guillain-Barre syndrome. Recent news that a 14-year-old British girl, Natalie Morton, died following her intoxicating inoculation against HPV has failed to alert people to the real risks downplayed by media companies whose owners have conflicting interests, including Zuckerman and Thomas H. Glocer, the media mogul CEO of Reuters News Service. Reuters reported in August that few serious side effects were observed during trials conducted by Centers for Disease Control (CDC) officials to promote Merck’s HPV vaccine, Gardasil. The CDC heavily favors drug industry initiatives, and collaborates on drug studies that are often biased in favor of pharmaceutical interests. Their studies are fraudulently designed to pass safety standards, Dr, Horowitz advises. For example, toxic vaccine additives called “adjuvants,” instead of pure saline, are used in safety trials as placebos. This results in fewer differences in adverse reactions between the experimental and control groups. Thus, claims of safety are completely unreliable. Reuters’s reliability is disqualified by Glocer’s position on the board of directors of Merck since 2007. He is also partnered with David Rockefeller in the world’s leading biotechnology trust called “Partnership for New York City (PFNYC). ” Members of this trust advance the world’s largest companies creating global drug markets. “So here you have the grossest conflicting interests persuading people to trust their children’s lives to liars and drug dealers,” Dr. Horowitz said, condemning the poisonous propaganda and vaccines issuing from the same financial interests. Zuckerman advances vaccine research and development at the Mortimer B. Zuckerman Research Center (MBZRC) in association with the Memorial Sloan-Kettering Cancer Center and Rockefeller University. The US News & World Report editor is a member of the Council on Foreign Relations, largely directed by his partner, the honorary PNYC founder, David Rockefeller. The Council, Zuckerman, and the Rockefellers endorse depopulation and vaccination sterilization, as does Barack Obama’s science czar, John Holdren. Zuckerman’s estimated net worth is $2.8 billion, a bit of which was used to finance the American Lyme Disease Foundation that heavily promoted SmithKlein’s disastrous Lymerix vaccine. That vaccine was pulled from the market following hundreds-of-thousands of reported injuries and deaths among recipients suffering post-vaccination symptoms of Lyme disease. “By simply doing a Google search on the additives used in vaccines, no one would ever consider giving these deadly shots to their children,” cautions Dr. Horowitz. NOTE TO JOURNALISTS: Dr. Horowitz is the author of sixteen books including the best-selling, Emerging Viruses: AIDS & Ebola–Nature, Accident or Intentional? His comprehensive FLUscam.com website provides recommendations for flu prevention and prompt remediation on the FLU “TO Dos” page therein, along with links to his endorsed silver hydrosol formulated to make vaccinations and antibiotics unnecessary. 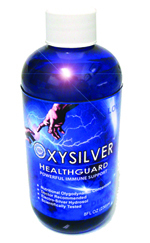 See: OxySilver.com or call toll free, 1-888-KO-GERMS, for more information.